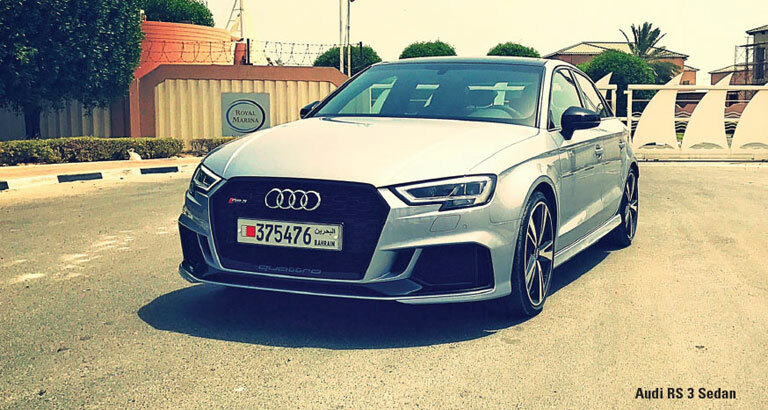 The Audi RS 3 is the first compact Audi sedan to bear the RS label and it sets the bar pretty high for all that dare follow in its footsteps. It’s easy to understand the immediate appeal of this model; I mean, come on, just look at it! It’s pure brawn, aggressively styled and packed with sporty character but it doesn’t lack finesse by any means. Smooth lines, clever contours and flared wheel arches make it a real sight to behold. As you would expect from Audi, the interior is pure luxury and each element has been clearly thought out. Black fine Nappa leather sport seats with RS logos on the backrests are standard but there are more contoured RS sport seats with integrated head restraints available as an option. There is an abundance of technology to make driving this sleek sedan even safer, more enjoyable, and, convenient. I must mention how well everything was laid out, user-friendly, easy to use – top points. The infotainment system in the model I drove is also worth bragging about. It had all the usual suspects, radio, Bluetooth, CD player, reverse cameras etc., but what makes this car special is that customers who opt for MMI navigation or MMI navigation plus can use the diverse range of online services provided by Audi Connect. They include, amongst other things, travel, parking and traffic information, access to Twitter and your email inbox, as well as navigation with Google Earth and Google Street View. Services are displayed on the MMI screen in the car and are operated via the multifunction steering wheel, the rotary/push-button control or by voice command. This lets drivers continue to devote their full attention to what is happening on the road. Let’s discuss what’s under the bonnet – the new 2.5-litre TFSI engine, which outputs 400bhp, making it the most powerful five-cylinder engine on the world market. To put that in perspective, it makes the dash from 0-100kmph in just 4.1 seconds but, trust me, it feels much quicker than that when you’re behind the wheel. Perhaps that’s because of the phenomenally fast S-tronic seven-speed dual clutch transmission? Since this model has a low centre of gravity, the handling is fantastic and I felt safe and secure taking even the sharpest corners. One of my favourite things was the different driving modes – comfort, auto and dynamic. While in dynamic mode, you can fine-tune the car to deliver the drive you want by adjusting the steering suspension and other features. Fantastic! I had great fun driving along the highway. Overtaking was smooth, the ride was comfortable and the generous amount of torque guaranteed I had the power I needed. I switched from automatic to manual a few times and really enjoyed using the paddle shifters. I had slightly less fun while cruising around the winding back alleys of Adliya. Although tight turns were met with confidence and parking was incredibly easy, I unfortunately had to put the brakes to a very real test. Luckily, they passed with flying colours – special shout out to the guy who was intently looking at his phone while running out into the middle of the road – I hope your Tweet was worth it! Call Audi Centre Bahrain on 17 459-933.